These are the plants of Ambergris Caye, for further information on the vegetation for all of Belize, click here. There are many varieties of trees on Ambergris Caye, some of which can be seen in San Pedro and within walking distance of town. There are two adaptive types of interest, some adapted to a harsh salt environment (halophytes) while others are adapted to fresh and brackish (slightly salty) water. As one goes from south to north on the island,-the amount of fresh water in the subsurface increases and hence the numbers of trees that need fresh water also increases northward. Many of the trees here are indigenous to Ambergris Caye while others have been imported from other areas of the world. Where the origin of a tree or any other plant in this book is known, it is given in the text describing a species. In the descriptions, the common name is given first and the scientific name, if known, appears last and is underlined. At times Spanish and Maya names are also given. At first glance, coconut palms appear to be the largest and most visible tree on Ambergris Caye. The palms and hardwood trees still do provide raw materials, as they have in the past, for many different commercial enterprises. The trunks are used for construction of buildings, docks and as rollers to launch and beach boats. The fruit of the coconut palm (the coconut) is edible and the husk has been used to make rope. Palm tree leaves are used as thatch for roofs, and some palm trees are grown as ornamentals. All in all there are 18 different kinds of palms found in Belize. For all its beauty and usefullness, it is not wise to sit or nap under a coconut tree: the falling nut can do considerable damage. This is still one of the most graceful and useful trees on Ambergris Caye and is probably of Indo-Malayan origin. The tree grows only in tropical and subtropical climates and was introduced and cultivated for centuries throughout the tropics as a cash crop. In 1577, Sir Francis Drake encountered the coconut in the Cape Verde Islands off the west coast of Africa and Captain James Cook, in his voyage of 1768 to 1771, reported them on most of the islands of the South Pacific. Reportedly, the Maya had no name or glyph for the coconut tree, it may have been unknown to them. The coconut palm has a relatively slender trunk, often curved or twisted, marked with external rings each year by the scars of fallen leaves. The tree can attain a height of 130 feet (40 meters) and is crowned with a cluster of very large, pinnate ( feather like) leaves 8 to 12 feet long. These trees are most-common along the windward side of Ambergris Caye. The fruit is the well known coconut which, when ripe, contains a white fleshy meat and a sweet liquid called milk. The young green coconut also contains abundant liquid that is quite refreshing. It takes about 1 year for an individual flower to produce a ripe coconut. The tree reproduces by dropping its coconuts, which are encased in a thick woody husk and look rather like a football and turn from green to light brown when ripe. They can grow where they fall, or, if dropped in water, be transported by waves and currents to other islands. After the coconut has dropped from the tree, the milk congeals into a spongy white ball filling the inside of the fruit and is the initial food source for a sprout (which comes out of an eye in the coconut) and a root, which comes out of the husk. This congealed milk serves the same purpose as the yolk sack in an egg, food for the embryonic tree. The sprout and the congealed milk are called a growing, and are edible. After sprouting, the tree requires about 6 years to reach maturity (the first coconuts appear) at which point the tree is usually 8 or 9 feet tall. Commercial coconuts are planted 20' to 301 apart and an acre of coconut trees may yield 10,000 coconuts a year, with an individual tree producing up to 450 fruits a year. 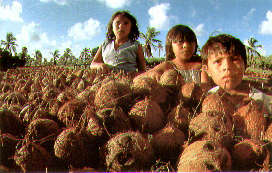 In 1952 Belize (then British Honduras) exported 2,531,730 coconuts and about 400,000 pounds of copra. A grove of coconut trees is called a coconut walk or a cocotal. Dried coconut meat is called copra and is used as a source of oil. One thousand full sized nuts will yield 500 lbs of copra from which 25 gallons of oil can be obtained. When it is boiled in water, the oil is released and skimmed off for later use. This oil has a wide range of used from cosmetics to cooking to fuel oil additives. The milk is sometimes used to make a very tasty bread, can be fermented to make coconut rum, making cheese and yogurt. The coconut meat is a popular ingredient in sweets. The fibrous husk was used to make coir, which in turn was used to make rope. The cloth like material at the base of the leaves is relatively soft and absorbent. The unexpanded flower spates form "toddy" which may be boiled down to sugar, or when fermented and distilled yields a spirit know as arrack. Coconut oil is also used to make marine soap which lathers in sea water. 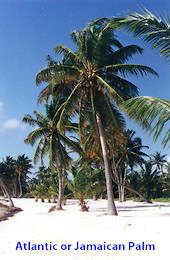 The coconut tree is still a commercial tree on Ambergris Caye. The nuts when they fall are harvested,and husked (remove outer layer).The coconut meal is ground and boiled with water. The oil floats to the surface and is skimmed of the top.The meat is also shredded, mixed with warm water and squeezed in a cloth to yield the white coconut milk.This milk is used in soups, and is poured over seafood dishes. Two animals are present that kill and damage this tree. Woodpeckers bore into the coconuts to drink the milk, killing the nut. The coconut weevil (beetle) carries a microscopic worm like organism (nematode) that kills the tree. The Creole name for this weevil is the "gru-gru". The bug flies into the head or top of the coconut tree where it lays its larvae. These eggs change into the large grub, which burrows in the heart.Shortly after, the leaves turn brown and the whole head of the tree collapses. Traditionally. when the tree is suspected of having the bug(as seen by the dying of the leaves and the falling of the immature nuts) the tree is chopped down and burnt. Because of the many neglected cocals on Ambergris and the lower coast of the Yucatan. evidence of Coconut tree mortality is frequently observed. The danger of toxic residues in the nut preclude the use of nematocides. Arsenic may be injected to kill the tree,but this practice is not carried out on Ambergris as this would contaminate the ground water supply. The Salt Water Palmetto is common on Ambergris Caye. This is a smaller tree than the coconut palm, with smaller, fan shaped glossy green leaves and attains a height of 10 to 12 feet. It grows on both sides of the island and is a halophyte (can tolerate salinity changes in the water around its roots). On the beach front it grows along with the coconut palm as seen especially in the Robles Point area north of San Pedro. The Salt Water Palmetto has so many uses that it is no longer common near San Pedro or on the southern part of the island. It is still found on the northern part of the island however. The tree is used to make temporary houses by bush hunters and as pilings for smaller docks, which are referred to locally as bridges or "muelle". It is also sometimes used for the smaller sea walls that are being built to slow down beach erosion. The trunk is hard and dense and heavier than water. Thatch (locally called "chit") made from the leaves is moderately durable and can last 5 to 10 years as a roofing material. The leaves are also stripped and used by fisherman to tie fish together for drying, and the whole leaves (sprinkled with water) are used to cover fish that are being brought to shore for protection from heat and sun. A fairly large tree with extremely dense wood that does not float in water. It is used extensively to build docks, "muelle", piers, sea walls and as rollers for putting boats in or out of the water. ibis wood is primarily imported from the mainland. Thatch roofs made from several varieties "guano" of the bayleaf palm leaves can last 25 to 30 years if properly cared for. Proper care consists of treating with insecticide to control pests that damage the roof. These large bay leaves are called "guano", and differ from the smaller leaf thatch "chit". This tree is an ornamental that has been introduced to Ambergris Caye in relatively recent times. It is a very slow growing tree. The name Christmas palm comes from the reproductive berries just below the beginning of the crown that turn red just before and during the Christmas season. removed from Ambergris Caye and Isla Bonita (San Pedro Town), is still very prime real estate investment property (highest ground along the island) being sold at a rapid rate by investors and speculators who don't live there but are located, primarily, in San Pedro Town. What is being sold are the isolation and spectacular and pristine beach and sea views, as seen above. The relative quiet and solitude of Ambergris Cayes is in striking comparison to the hustle, bustle and noise of Isla Bonita - just minutes south and soon to be even closer when the bridge across Boca del Rio (the canal that separates Ambergris Caye from Isla Bonita which contains San Pedro Town.) is built. Littoral Forest, however is the last remaining habitat for the soaring and water birds that are famous in this area. It is prime nesting and resting cover and when it is removed, the birds will be permanently removed as well. (Including the beautiful Frigates and, Belize' national bird, the Pelicans that soar down on the wave of air along the beach front, from nesting areas, to San Pedro Town.). There are land trusts set up by Belize to manage this habitat. However, the governing bodies in place see a greater need for national cash income than the impending extinction of this very small, hardly understood habitat and tend to be very liberal in their granting of development permits to land speculators. Indeed, Belizean land tax structure tends to penalize undeveloped land in comparison to land with construction and development on it. And so, the bulk of preservation goes to private owners and international preservation societies who buy tracts of undeveloped Littoral Forest and set them aside as reserves. Mangroves are trees that are adapted to live in areas that are often flooded by water, places called wetlands. In these areas there are three types of mangroves: red, black and white that live in saltwater wetlands. Each has a different tolerance for the amount of salt and water they can live in. 1. All mangrove roots trap sediment washed from hillsides during rain, especially from cleared land. This keeps our ocean water clear and protects our reefs and seagrass beds. Mangroves are often called landformers since the soil they trap causes the shoreline to grow seaward over time. The mangroves continue to grow out on the edge of this expanding shoreline while terrestrial plants colonize the land behind the mangroves. 2. Black mangrove pneumatophores not only act as a "snorkel" for the roots to breath, they trap sediment and may remove chemicals from water running into the sea. Many people view these areas as wasted land and would like to fill them with soil to make them productive. This covers the pneumatophores and kills the trees. 3. Red mangrove roots underwater serve as a nursery area for most coral reef fish and many invertebrates. Most fish caught by fishermen on reefs need this important habitat to grow up in, safe from predators and with a good food supply. These roots also protect our shorelines from wave erosion during storms. 4. A lot of terrestrial wild life such as hummingbirds, pigeons, herons and iguanas either nest, rest or feed in mangroves over water to be safe from predators. 5 The red mangrove leaf is dark green and shiny. The fruit is called a "pencil" and is actually a baby tree that sticks in the mud and grows when it falls from the tree. It may also float great distances to colonize other areas. 6. The white mangrove has adapted to living in wet, salty soils by excreting excess salt through pores at the base of each leaf. Look for these bumps with a little hole on top. 7. Black mangrove leaves are long and narrow and covered with salt crystals underneath. This is how they have adapted to living in salty soils and ridding themselves of excess salt. 8. Since mangroves often occur in protected bays, they are ideal sites for marinas and boat facilities. Tying your boat to mangroves in a storm is considered OK, but as a long-term mooring method it can damage the bark and kill the tree. 9. Many people think of mangroves as smelly places suitable for dumping trash and other unwanted material. This can damage the roots and harm the crabs and birds that live here. Dispose of your garbage properly. 10. Decaying leaves and twigs in the water under mangroves provide a rich source of nutrients for other nearby marine ecosystems such as seagrasses and coral reefs. In general, mangroves have been found to be useful in a variety of ways. Red mangrove wood is heavy and durable. The bark is used for tanning and medicinal purposes. The bark, leaves and shoots yield various dyes. The leaves have been used for cattle feed and contain high amounts of protein. The flowers of most mangroves yield high grade honey and the woods are used for charcoal production. Through careful management all of the values and uses of mangroves can be maintained. Mangroves are indigenous to the tropics and subtropics worldwide with most of the species found outside of the Americas. There are three species of mangroves growing on Ambergris Caye and throughout Belize, the red, the black and the white. Since some of the soils on Ambergris Caye are poor in nutrients many of the mangroves are relatively small. In good, nutrient rich soil the red mangroves can reach 60 feet in height. Some of the mangroves that are growing on the edges of Mayan sites and on the southern part of Ambergris Caye in richer soil, attain heights of 40 to 50 feet. The reason that most of the soil on Ambergris Caye is so poor is that it is forming as a result of weathering limestone and carbonate sand with very little organic matter. The carbonate sand (of which the beaches are made) is composed of broken skeletal fragments of the organisms that live in the reef and on the sea floor behind the reef. The limestone consists of similar skeletal fragments that have been cemented together with calcite to form a rock. The mangroves are probably the most important trees on Ambergris Caye for several reasons. They help add dry land to the island, protect the shoreline, provide shelter for juvenile marine life and are the beginnings of a food chain for some marine life. Mangroves growing along the shoreline have an extensive root system that helps to trap and hold mud and sand brought to shore by normal wave and current action. These sands and muds accumulate until they are extensive and thick enough to support other plants and trees. Eventually dry, or almost dry land has been added. On parts of Ambergris Caye, especially the southern part, the island is slowly growing partially due to mangrove colonization. This type of land growth can be quite spectacular. A seaward migration of mangroves of 115 yards per year has been recorded in Sumatra and almost 180 yards per year in Java. Once established, mangrove thickets protect the shoreline from erosion due to normal storms and tides. They act as a buffer to dampen and break up wave action, lessening erosion. Even in large storms an extensive mangrove thicket can provide some protection for both the shore and inland areas. The root system of the red mangrove, the one that grows in the most seaward position, provide shelter for much marine life including juveniles. Many of the fish and crustaceans of Ambergris Caye find protection here in their vulnerable early growth period. Although no studies of Ambergris Caye have been popularly published, Florida and the Tortugas provide one example of how important this can be in the case of the pink shrimp. The millions of pounds of pink shrimp caught off the Tortugas spend part of their life cycle in the Everglades mangroves. It is estimated that 250 acres of mangroves produced 4 tons of shrimp a year. Numbers of finfish are smaller, but the Florida mangroves alone contribute millions of pounds to the commercial catch (Wiley, 1985). In addition to juveniles that shelter here, many marine forms live on the root system itself. Barnacles, oysters, tunicates and a variety of other organisms encrust them, sometimes to a thickness many times the diameter of the root. The beginnings of a food chain start when the mangrove drops its leaves into the water (the trees concentrate salt in their leaves and then drop the leaves to rid the plant of excess salt). As soon as the leaf reaches bottom it is colonized by algae, bacteria and fungi and it begins to decompose and break up. One celled protozoa come to eat the bacteria and fungi and the leaf fragments covered with protozoa are now nutritious food for many species of small fish, crustaceans, worms and many other invertebrates. Algae growing on the prop roots of the red mangrove also serve as food for small invertebrates. These in turn are the prey of larger fish, crabs, birds, etc. that live in the mangrove swamps. In fertile areas, such as river deltas, mangroves can contribute more than 3 tons per acre per year of organic material. The smaller mangroves growing on Ambergris Caye contribute much smaller but still significant quantities of organic material to the food chain. Although mangroves are halophytes, they can also do quite well in fresh water. Mangroves, watered with fresh water, have lived on dry land for 50 years at the U. S. Botanical Garden in Washington. Mangroves apparently evolved from earlier land plants which developed a tolerance to salt but did not come to depend on it. All three species of mangrove are native to Belize and Ambergris Caye. The mangroves apparently originated in the Old World, in the area of Malaysia and spread out from there. In the Pacific there are more than 60 species of mangroves while in the new world there are only 12, but Florida and Belize have only three species. Mangroves provide firewood, charcoal, lumber and a source of tannin, the natural chemical used in tanning leather, not Only to modern man, but, in the past, also to the Maya. The red mangrove can tolerate normal marine sea water, hypersaline water (seawater concentrated by evaporation) or fresh to brackish water and is known as a facultative halophyte (it can live in saline water but is not limited to it). This mangrove has a complex system of prop roots and lower branches that form a nearly impenetrable thicket. The roots make graceful arcs from the trunk to the ground. The bark of these roots is red, especially when wet; Also, the leaves turn yellow and then red as they die and fall off. The leaves are much larger than those of the other two species of mangroves. Since the roots of these mangroves are in seawater and muds where no free oxygen is present (anaerobic), the trees have developed specialized branches to remove oxygen from the atmosphere. In the red mangroves these consist of flexible air roots hanging down from the trunks and lower branches. These air roots, which have no leaves, have special pores (lenticels) that are covered with loose waxy cells that allow air in but not water. If an air root reaches the soil, it will become a prop root. Lenticels also occur on the prop roots. The red mangrove flowers all year with small yellow flowers that have 4 petals. All three species of mangroves are viviparous, which means the embryonic plants develop while attached to the parent plant. Known as propagules, these young plants drop off the parent plant into the water to be carried where ever the currents are going. The propagules of the red mangrove are 8 to 10 inches long and look rather like long thick brownish coloured green beans when they drop from the parent plant. Called hypocotyls, they drift until they touch bottom and then send down roots and sprout leaves. The small trees you can sometimes see growing by themselves in shallow water offshore, are young red mangrove trees. All going well they will grow and add more plants and eventually help establish a new shore line. 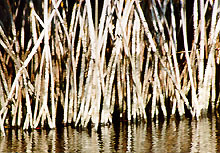 The black or honey mangrove does not have prop roots like the red mangrove but sends a line of numerous vertical pneumatophores (they look like small flexible bare sticks) tip through the mud from its shallow root system. The pneumatophores stick up above the mud bottom to an inch or so above the average spring tide level (highest monthly tide) and have lenticels on their tips for breathing. The tree leaves are normally elliptical with a rounded tip and are smaller than the leaves of the red mangrove. The bark on some of the branches can be very dark, almost black. The flowers of the black mangrove produce abundant nectar that bees can convert into excellent honey. The black mangrove has glands on its leaves that can excrete salt, and if it has not rained recently, small cubic salt crystals reflecting the sunlight can be seen on the leaves. Ask your guide to be SURE of your identification. One can taste the large amounts of salt exudate by licking the leaves. The propagule of the black mangrove is shaped like a lima bean and is up to an inch long. After it drops from the parent plant into the mud or water, it splits open and sends out a root. Then the two sides unfold all the way to become leaves, exposing two smaller leaves inside. When it touches bottom it sends roots down into the mud and continues growing. The white mangrove also lacks the prop roots of the red mangrove and sends up pneumatophores which are smaller diameter (often pencil diameter and less abundant than those of the black mangrove. The leaves of the white mangrove are elliptical, usually pointed, and midway in size between those of the red and black mangrove. The bark on most of the branches and upper trunk is white. The lenticels on the white mangrove are on the trunk. The white mangrove also excretes salt through glands on its leaves, although to a lesser extent than the black mangrove. When these mangroves reach sufficient height (as they do on the southern part of Ambergris Caye) they are used for masts in sailing boats and as lumber for construction. The upright posts and cross beams of some of the open buildings with thatch roofs in San Pedro are from the white mangrove. Idealized sketch of the distribution of the red mangrove, black mangrove and the buttonwood trees. The tropical almond tree is thought to have originated on islands in the Bay of Bengal to the east of India, or in Malaya, but is now widespread in the tropics. The genus Terminalia has around 250 species assigned to it. The tree is deciduous to partially evergreen depending on the climate. The branches grow horizontally in a tier like manner on the trunk that give the young trees a layered look. The leaves are large, up to 12" in length, 7" in width and they grow at the end of the twigs and branches. The flowers grow on long spikes and are whitish with greenish white the most common hue. The fruit is a green flattened ovoid up to 2" long and has two angles on the edges. When the fruit is ripe it is yellowish with a fleshy outside and a fibrous to woody interior that surrounds the seed inside. The outside flesh is mild and rather sweet. On Ambergris Caye, in the winter, September and October, most of the leaves turn red and fall off, getting new leaves in the spring when it flowers. However it must be noted that due to the mild climate, it can flower nearly all year long. The fruit and nut of the tropical almond tree can be eaten raw, the nut roasted and the nut is also used as a source of oil in some of the areas where it grows. The fruit is also a source of tannin used in tanning leathers and can be used to make dyes and inks, as well as being used in pharmacy. It is a popular shade tree. The avocado is native to Mexico and Central America but now is widely cultivated. It grows wild from Mexico to the Columbian Andes. It was cultivated long before the Spanish arrived. The tree has a straight trunk with a spreading crown and will bear fruit 4 to 8 years after planting. The leathery leaves are elliptical to lanceolate (shaped like a lance head) and strongly veined. The flowers are small (6mm) and grow in bunches. The fruit is a large fleshy pear shaped drupe with a green skin. There are many varieties and the skin colour and texture varies from variety to variety. The seed is large and has 2 halves. The fruit is very rich in vitamins, proteins and fats (7 to 23 %) with little sugar. The tree reproduces by sprouting from the seed or by budding and can be grown by taking cuttings. The fruit of the avocado is used primarily as food. Oil from the avocado has also been used as salad oil and in the manufacture of cosmetics. The banana plant has been cultivated for over 4,000 years and has been extensively hybridized. Originally from Asia, it is really not a tree in the true sense. Instead of having a woody trunk, its trunk is made up of the remnants of the closely packed leave sheathes formed after the leaves have died and fallen off. There are many varieties of bananas of which the plantain is one, and both the yellow table banana and the plantain grow on Ambergris Caye. The exact species here is unknown but the two listed at the top are the most common ones grown in this part of the world. The banana tree has a trunk with the leaves growing at the top of the tree. It grows from 10 to 30 feet tall. The leaves grow on short sheathed stalks with very large oblong blades. The leaves have a heavy central vein with smaller secondary veins growing to the leaf edges. This leaf shreds easily in the wind to give it a tattered look. The leaves come out spirally to form the top crown. The flowers grow on spikes with lavender leaf-like parts and yellow flowers. The banana tree is a sterile hybrid, in spite of bearing flowers, and reproduces through basal suckers. It cannot tolerate high winds. The fruit of the banana, which is technically a berry, is widely used raw and in cooking and the banana tree is capable of producing a lot of food per acre. The plantain is a starchier fruit and is used in cooking. Once the banana or plantain bunch has been cut, the plant then dies and is cut down. Suckers come up from the base of the old plant and then these are replanted to give a new plant. The yellow banana and the plantain will grow a new fruit producing plant in 6 to 9 months. The breadfruit, a member of the mulberry family, is probably native to the Sunda Islands, but now is cultivated in Asia, America and the West Indies. It was the transportation of the breadfruit to the West Indies that sent Captain Bligh (with the encouragement of Capt. James Cook) on his ill fated voyage on the HMS Bounty (1789). Although mutiny terminated his first voyage, he succeeded on a later voyage in 1792 in bringing the breadfruit to the Caribbean, but it was not able to replace the plantain as a staple food of the area. The breadfruit grows on Ambergris Caye, but is more common on Caye Calker. This is a large tree with a spreading crown that can get up to 601 tall. The leaves are large, up to 21 long, leathery and deeply lobed. It has male and female flowers on the same tree with the male flowers growing on a stalk shaped rather like a club while the female flowers are round. The large fruit (10-12 inches long) is round and weighs up to 4 pounds with a stringy flesh rich in starch and sugars. After three years the tree bears fruit which turns slightly yellow when ripe. The fruit can be eaten boiled, baked, roasted or dried and made into flour. The tree can be reproduced from cuttings, but needs high humidity and high temperatures for growth. This tree, along with two other species, is native to tropical America, with lanceolate leaves 5 to 10 inches long on short stalks. It has yellowish flowers that are about 1" long. The fruit is heart shaped, tan or reddish brown up to 5" long with a lumpy surface and impressed lines on the skin. The flesh is creamy white, but very soft which prevents it from being shipped to markets in the temperate zone. The guava tree is native to Central America, and there are several varieties. This evergreen grows up to 261 tall and has a slender trunk with dark brown rough and scaly bark. The leaves are light green and are oblong to oval. They are leathery with a downy underside. The young shoots are green and are 4 angled. The large flowers occur near the stem and usually have 5 petals with emergent stamens. The fruit grows as a round or pear shaped berry usually greenish yellow. The flower calyx lobes remain on the end of the fruit like on a pomegranate. The fruit flesh is white, yellow or pink often with a strong smell that is eliminated in cooking. The tree can be propagated by cuttings or grafting. The best varieties can be eaten raw, but most are preserved by making into jam that is quite good. The hog plum, related to the cashew and the mango, is a very popular fruiting tree on Ambergris Caye and is widespread throughout the tropics. It has heavy branches and stout twigs, with leaves composed of 9 to 25 yellow green leaflets. The flowers are small and yellow, growing in small clusters on older branches. The fruit is a slightly sour yellow to purplish red plum-iike body up to 1 1/4 " long with a large round seed. The eating quality of the fruit varies from tree to tree, but the best fruits are cooked and eaten. If one buries the mature limes about 1' deep in the sand, they will keep for 1 month or so without rotting. This popular citrus fruit originated in the Malay Archipelago, but now has a wide cultivation in mild climates. It is one of the most tender of the citrus family and cannot withstand low temperatures well. This is a shrubby tree often with a crooked trunk, many branches and sharp spines. The leaves are ovate 1" to 3 long and are fragrant when crushed. The flowers are about 1" in diameter and are yellowish white with tinges of purple on the petal margins. The fruits are oval to round with a thin rind that is yellowish green or green when ripe. The pulp is very acid. They flower and fruit all year but are most productive from July to September. They can tolerate a salt water climate better than other members of the citrus family and hence can grow closer to the sea shore than other citrus fruits. They can be grown by planting seeds, cuttings and by budding. The lime is of course very widely used to make refreshing drinks, desserts, as flavourings in other drinks and as a flavour enhancer in other foods. It is an excellent source of citric acid, vitamin C. There are several varieties of limes that vary in tartness and flavour. This tree grows to 20' to 25' tall with remarkable growth in the first year. The trunk is straight with scars from the fallen leaves on it. There are no true branches, the leaves grow out from the trunk on a hollow stem that is about 20" long. The leaves are palmate (hand like). Some varieties carry both male and female flowers on the same tree while others have distinct male and female trees. The plant flowers on the stem rather than out on the leaves. The fruits are melon to gourd shaped and are yellow when ripe. The skin is thin and the flesh is orange and pulpy. The fruit has a central cavity that carries many black seeds in it. It can be grown from either the seeds or from cuttings. The fruit is quite edible and very good. The tree sap contains a latex from which papain, a digestive enzyme is extracted. The enzyme papin also from the meat of the fruit is reportedly used to alleviate jellyfish stings, or as a meat tenderizer. The Sea Grape is native to the tropics and subtropics of the Americas. This can be a shrub or a tree up to 251 tall. It has stiff leathery round leaves up to 8" across that are slightly heart shaped at the base. The leaves are yellowish green to olive green with red veins on new leaves that become ivory coloured on older leaves. There are male and female trees with the small white flowers growing on spikes. The female bears the fruit. The fruit is the size of a large grape, purplish and contains a large seed. The fruit ripens May to August. The fruits can be eaten raw or may be used for jellies and wine. Reportedly, the bark may be boiled for a solution to treat gum diseases. This tree is identifiable by its dark green lanceolate leaves that are wavy on the leaf margins. It hid-small red berries. As with many poisonous plants, sensitivity to contact with it depends on the individual. A few are affected by proximity to the tree without actual contact while a few others can walk through its foliage with little effect. For most however, contact with the leaves or bark of the tree produces itching and blistering of the affected skin, much like the poison ivys, oaks and sumacs of North America. Fortunately visitors are unlikely to encounter che chem unless you go into the bush and then long trousers, long sleeve shirts, shoes, socks and a little care will keep contact at a minimum. There are remedies to counteract the effect of che-chem it you happen to come in contact with it. Holube is a plant with bright green leaves that look a little puckered. They come out two at a time at the ends of the twigs. The leaves of this plant when crushed and mixed with warm water make an antidote for poisonwood that is applied to the affected skin. This plant is often found growing close to the poisonwood. At Ambergris Caye the loading and unloading area on the leeward side of the island is called a barcadero. The logwood has long figured in the development of Belize. The following is excerpted from the 9th edition (1882) of the Encyclopedia Britannica. "Logwood is a valuable dyewood, leguminous, native of Central America. The tree attains a height not exceeding 40 feet. It is said to be ready for felling when about K years old. The wood, deprived of its bark and sap-wood, is sent the market in the form of large blocks and billets. It is very hard and dense, and exteriorally has a dark brownish red.colour. The best qualities come from Campeachy, but is obtained there only in small quantity. A large export trade of logwood of good quality is carried on from Honduras and Jamaica. The wood was introduced into Europe as a dyeing substance soon after the discovery of America, but for many years (from 1581 to 1662) its use in England was prohibited by legislative enactment on account of the interior dyes which at first were produced by its employment. The chemical reaction of heamatoxylin is extremely rapid and delicate, rendering that body a valuable laboratory test for alkalis. Logwood is prepared for use by dyers, etc., in the form of chips and raspings and as a solid brittle black extract. Chipped logwood is moistened with water and spread in thin layers until a gentle fermentation sets up, whereby, under the influence of liberated ammonia, haematoxylin is formed from the glucoside. By exposure to air, through repeated turnings of the mass, haematein is developed from the haematoxylin, and the chips gradually become coated with the brilliant metallic green crystals of haematein. Logwood extract (haematein), largely used in calico [cotton dress material printing, is obtained from the chips that are oxidized by the haematein, by lixiviation (leaching), the solution being concentrated at as low a temperature as possible. Logwood is also used for dying woolen goods, in which it produces with various mordants, shades of blue, from a light lavender to a dense blueblack. Logwood blacks assume a bright red tint by the action of dilute acids, a test by which they can readily be distinguished from aniline dyes and other fast blacks. Logwood is also largely used in the preparation of ink and to a small extent in medicine. The imports of logwood into the United Kingdom during the year 1880 amounted to 69,290 tons, estimated value o: which was 192,392 pounds sterling." Capt. Nathaniel Uring was shipwrecked in Belize in 1719, here are a few quotations concerning his attempts to purchase logwood. "And these goods and provisions I had left, I sent up the river of "Bellese" to the "bercadares". The country is ail a Flat, and great part of it a morass, which in the rain times are almost all over-flowed. In the dry time of the year, the Logwood-Cutters search for a work. .....	and load'm, which they bring to a Creek-side and there lade their Canows (canoes) and carry it (logwood) to the "barcadares" (camp on the side of river) The general Price of the Wood at the "barcdares" is Five Pounds "per Ton Jamaica Money"
As late as the 1890's logwood was still harvested on Ambergris Caye. The dye is still used today in histological stain preparations for medical research. These are very abundant when walking to the old airstrip at Basil Jones. Most trees of this genus are found in Africa and Australia, but it is also native to Central America and is found on Ambergris Caye. One species is Acacia cornigera. it has pinnate (feather like) leaves and yellow flowers. One conspicuous feature is hollow horn like thorns that are quite pronounced. These thorns are often inhabited by ant colonies. Various parts of this tree reportedly have several medicinal uses in folk medicine (chew the root as an anti-venom, thorns are boiled for asthma, bark boiled for acne and erysipela, nine of the ants squeezed in water and the liquid drunk for catarrah). North American visitors to Ambergris Caye may confuse Acacia with the "mimosa" trees popular there as shade trees and ornamentals. The trees sold in North America are species of the genus Albizzia, probably A. julibrissin as it is much more tolerant of winter conditions than other closely related trees. The leaf and flower forms of Mimosa, Albizzia., and some Acacia, are quite similar. This showy tree is native to Australia, New Caledonia, Borneo, Sumatra, Southern India and the Malagasy Republic. At first glance this tree looks like a large whispy pine with drooping needles. The "needles" are small green branchlets with the true leaves occurring as small scales around the nodes of the branchlets. The branchlets themselves contain chlorophyll and act as leaves also. Each tree bears male and female flowers with the male flowers growing on long spikes and the female as compact clusters. The fertilized female flowers swell into seed cases that look rather like a pinecone . These cones turn from green to brown and the seeds which fall out have "wings" on them. The Australian pine is a long lived tree and has dense hard dark red wood that barely floats if at all. They are tolerant of a wide variety of soil types and tolerate saline swamps and tidal estuaries. This tree was used by the people in Australia for war clubs and is used in furniture in some places. The bark contains tannin for tanning leathers. It is adaptable as a patio tree and has become quite popular as such. Both this tree an the white mangrove are locally called "botoncillo". one specimen of the buttonwood can be seen next to Rubie's Hotel. Close to this may be a wild mulberry tree, not common on Ambergris but has been reported on other islands in Belize. A bushy tree, it can get up to 30'tall and is best characterized by its large round, flattened, wrinkled, brown-black seeds that are slightly indented in the center. This tree grows to be quite large in its native state. The bark is quite distinctive. It has a paper thin outer layer that is red when it peels off the tree and the bark just under it is a bright green when scratched. One of the most remarkable properties of this tree is its ability to root from branches cut from it. When a branch is cut and 71anted right end up, it will root and leaves will come out of the top of in. After a few years it will form a nice tree on its own. The gombo limbo is used as a living fence and divider in many places in the town of San Pedro. The bark has also been reportedly used as a remedy for gum disease and tea made from it is used as a treatment for high blood pressure. It also has a sweet fragrant sap used in glues, medicines and paints. This majestic tree is native to Norfolk Island ( 13 square miles in area) 930 miles northeast of Sydney, Australia. This tree is unusually symmetrical with the branches coming out in layers, best seen in young trees and at the tops of larger trees. It can reach 200' in height. The foliage is a light green. It is quite popular as a potted plant when young. The rubber tree was originally from India and Malaya, and was introduced here. This plant is familiar to many as a popular and hardy house plant. The leaves are thick, glossy, green and elliptical in shape with a definite point on the end. They have a prominent mid vein and smaller veins at right angles to it that extend to almost the leaf margin. New leaf buds are sheathed in large rosy stipules that fall off when the leaf emerges. The fruits are egg shaped and about 1/2" long They are yellowish green and grow in pairs on shorter twigs. This member of the genus is the source of India rubber which Western culture found made excellent erasers. There is a rubber tree native to the Belize mainland (Mayan name "yax-ha or "kiik-che", and in Spanish "hule"), but it is not related to the tree on Ambergris Caye. The largest, most beautiful specimen of this tree can be seen in a private yard behind the Amigo Travel office (seek permission). A small one is in the Sun Breeze patio. This plant is originally from Mexico and Guatemala, but now is found throughout Central America. It has long, stalked, palmate leaves with leaflets that have 5 lobes that are 4" to 9" long. The leaves are dark red when young, turning green as they mature. The distinctive flowers appear before the leaves. The flowers have 5 purple petals that separate and curl back to frame a cluster of feathery pink stamens with golden yellow ends. The fruit is a capsule. The fruit contains a fluffy fiber around the seeds that can be used like kapok. one version of Mayan folklore contends that if you hang yourself from this tree, you would go to Paradise. On the leeward beaches of Ambergris Caye, and especialy in the bush at Basil Jones, this tree is very common. In the last century and early in this, the chicle business was very important in Ambergris and Yucatan. The Sapodilla is a large tree native to Yucatan and Central America. This tree can grow 80 feet high on the mainland, but on Ambergris Caye it tends to be much smaller and grown on the lee side of the island. The leaves are leathery, elliptical and 2" to 5" long and are evergreen. The flowers are cup shaped and 1/2" in diameter usually with a 6 lobed calyx. The flowers are white or pale green. The fruits are egg shaped, russet brown up to 6" in diameter. The reddish flesh of the fruit is edible and has seeds. The wood is exceptionally strong and durable and was used by the Maya for spear shafts, lentils, bowls and boxes. The tree once used as a source of chicle for chewing gum. The inner bark contains a milky latex that is gathered by cutting grooves in the bark and collecting the sap. It was then boiled to make blocks of chicle. Few plantations were set out and most of the chicle was gathered from wild trees. Each tree could only be tapped every 6 to 8 years and then about 15% of the trees died as a result of the collecting process. This tree has pointed leaves and orange-red flowers that grow in clusters. The seeds are the size of a walnut and can be used in preserves when cooked. It is notable for its very striking wood. This wood is used to make carvings and for other decorative purposes. There are several species of the genus Cordia and as a result this very common tree is referred to just by the generic name. The leaves terminate in very sharp black points. It has a large woody, fiberous stem, 15 to 20 feet tall, with the leaves as crowded tufts at the base of the stems that terminate in very sharp black tips. The flowers occur on branched terminal panicles and are large, white, bell shaped and pendulous. The flowers are fertilized by moths. The succulent fruits resemble small bananas and are cooked as an article of diet. The roots contain a saponaceous matter used in the manufacture of soap. These hardy plants can be grown even in Great Britain. It is often referred to as sisal hemp or Yucatan hemp, although it is not a hemp, but a true fibre. It was extremely valuable in the manufacture of rope in the past. In 1880, the port of Progresso, Yucatan, shipped 40 millions pounds of this material, valued at 350 million pounds sterling. It is found at San Juan (Mayan ruin) in the northwestern of the island. Bamboo is a member of the grass family that has a wide distribution world wide of about one thousand species. There are small stands of bamboo in more remote parts of Ambergris Caye. It has a woody stalk that is usually hollow and the interior is divided by septa or nodes. Most bamboo flowers only at long intervals and all plants of the same species, where ever they are, flower at the same time. After developing seed heads that look rather like wheat, all the plants die with new growth the result of both growth from the seeds and from shoots that come up from some of the roots that survive. Between times of flowering, bamboo propagates by sending out underground runners that develop shoots. Unlike most other plants, the new bamboo shoot emerges with the same diameter it will have at maturity, it does not get bigger around as it grows, only taller. The first successful light bulb had a filament of carbonized bamboo. On Ambergris Caye, bamboo roots wash up on the beach and the stalks are used in finishing and decorating homes and other buildings. Most of the bamboo on the beaches of Ambergris Caye originated on the mainland and was carried to the sea by mainland rivers. The root of the bamboo that washes up on the beaches of Ambergris Caye is twisted, ribbed, and has strange shaped secondary roots and buttonlike protrusions. These roots often form outlines that look like strange animals and are used for decorations. There is one next to the Sr. Paz at the Sun Breeze Hotel, and the branches have been trained to ornament the inside of the bar. Bougainvillea is native to South America and is new widely cultivated and hybridized. It was named for Louis Antione de Bougainville, a French navigator and explorer who died in 1811. It was first described in the Faulkland Islands. It is a woody vine with thorny stems. The leaves grow on snort stalks and vary a lot in their shape even on the same plant. The true flowers are small and tubular, but are surrounded by large, showy, colourful petal like leaves in shades or red or purple. These are natives or tropical America and are stemless plants with stiff leaves. The flower grows at the top or a central stalk that emerges at the time or flowering. There are two types or bromelaides, those that (like the pineapple), root in soil and those that fasten to other plants and receive their nutrients from the air and rainwater. They are somewhat popular as ornamentals. This family or plants are named after the Swedish botanist Olaf Bromelius. This is a favourite local dish when boiled and then re-tried with eggs. This plant is common in many private yards. Ask your guide to show you the plant. This rather large plant has some spines on the stalk, and green leaves and flowers near the top or the plant. After boiling they are edible and have a flavour similar to that or spinach. The spines or the plant have been known to give the careless an allergic reaction. This shrub is native from South Florida through the West Indies down to Brazil. It usually forms a low shrub with ovate to blunt glossy leaves up to 3" long that grow on.short stalks. White flowers are followed by round edible fruits that are dark red to purple to white and are very wrinkled when ripe. The fruit is bland and slightly sweet. In Mexico, the oily fruits are used to make candies and a black dye. The fruit ripens from October to November on Ambergris Caye. Cotton: "algodon" in Spanish and "ta-man" in Maya: Gossypium species: Family Maivaceae-mallow family, which includes the okra. Behind the Paradise Hotel, on the Langford property, there is the only small commercial vegetable garden in San Pedro Town. It is on black earth composted by the Mayas. A cotton plant may be seen there, next to Rosalita's. Cotton in various forms is native to the warm regions of both the Old and New Worlds. The Mayas used native species for their textiles. The species native to Belize is Gossypium mexicano. This bush has palmate leaves that are lobed, but undivided. The blooms have 5 petals that change color after they are open, so there can be different coloured blooms on the same plant. The fruits, called bolls, have seeds that are enclosed by fibers or staples in the cultivated varieties. The staples are used to manufacture cotton cloth and the seeds contain oil. Capt. Uring recounts that the logwood cutters wore clothes made of heavy cotton fabric and in his accounts he mentions several different types of cotton cloth that were important at that time. Frangipani: "suchil" in Spanish: Plumeria species. There is one across from the diesel powered generating plant. Its yellow, red and white fragrant blossoms are a favourite and many yards in San Pedro have it in them. It was supposedly named after a marquis during the reign of Louis XIV. These are widespread in warm climates and most are moderate size plants, although some species are shrubs and trees. The flowers are often in shades of red with a flaring trumpet like shape and stamens that are quite pronounced. The plant is a favourite as an ornamental. Native to Central America the sensitive plant has finely divided feather-like leaves and pink to purplish flower pompoms. then touched, the leaves fold up to reopen in about 10 minutes. To the Maya it is x muts and to the Spanish dormilona. In addition to the sensitive plant there are two other species of Mimosa native to Belize. A stout bush with light yellowish green stems and leaves, the leaves come out one at a time alternately along each branch. The small red slipper-like flowers are about the size of the head of a kitchen match. These bushes are thought to bring good luck and are planted at the foot of stairs or at doorways. This pan-tropic plant is common on sandy beaches, and can be found as far north as the beaches of south Texas. It is a creeping, non-twining vine up to 60" long with fleshy oval green leaves that are slightly notched on the ends. The flower is funnel shaped and is purplish pink with a red center. This plant is related to the familiar sweet potato or yam. This familiar evergreen ornamental is a low trailing bush with moderate size flowers of blue, pink and white. Periwinkles tolerate a variety of soil types. The poinsettia is native to Mexico and Central America and is named after J.R. Poinsett, the first United States Ambassador to Mexico in 1832. In the wild, the plant grows quite tall with rather bare stems and leaves confined to the upper part of the stem. The true flowers are small, yellow and occur at the terminal end of the stems. These are surrounded by red brachs (leaf like petals) to give it its distinctive look. These brachs may also be pink or whitish. The Maya call it cuetlaxochitl, the flower that fades, and the Spanish call it the Christmas Eve flower. Traditionally throughout Belize, this vine is used extensively as a therapeutic beverage. The leaves are boiled and the elixir ("tea") which has a bitter taste, is drunk by people of all ages. It may have diuretic properties and is a very mild purgative. Ask a local resident to show you this vine, as it grows in many yards. This dense twining and climbing vine is featured on the 1985 San Pedro telephone book cover. It has green leaves, a bright yellow flower that is followed by a bright orange ribbed pod that contains seeds. The seed pod splits open and turns itself inside out to expose the seeds. The seeds in the pod are encased in bright red, water rich flesh. These are very often seen washed up on the beach and are known as "Horse Eyes" if large and the smaller ones are called "Deer Eyes", both of these are blackishbrown. A white-purplish sea bean also washes up and is called a "Sea Pearl". When rubbed vigourosly against a hard surface the, "Deer Eyes" become very warm (not dangerously so), and children often harass one another by touching each other with the heated beans. This is a general term for various seed pods that wash up on the beach. one of the common ones is a dark brown rather featureless pod that is a rounded flattened oval with one side straight where it was attached to the plant. A second common type is a smaller brown flattened oval with a dark band outlined in a lighter colour that circles the largest diameter of the pod. One of these seed pods is an oval, cream to greyish white, with small ridges around the pod. A large (2 inch diameter) red to reddish brown,flattened rounded oval in shape bean that is found on many beaches other than just Ambergris Caye. On Padre Island off of Texas they are called sea chestnuts. These seeds grow in 5 foot long seed pods on a 100 foot long vine found principally in Jamaica. The uncooked kernel is toxic to man but medicinal properties are attributed to it by primitive peoples. Cabeza de Vaca, an explorer who lived among the Karankawa Indians from 1528 to 1536 as a trader, reported in his journal that from the coastal region he took "Conchs used for cutting, and fruit like a bean of the highest value among them, which they use as a medicine and employ in their dances and festivities". A smaller (about 1 inch long) brown seed with a black band running most of the way around it. They are locally called deer eyes and are reputed to bring good luck. This genus may have originated in South America, but most recently has come from the Lesser Antillies and is a very common plant on Ambergris Caye. It has a dozen or so leaves in several sizes that are narrower at the base than the top. The flower stalk is roughly the same height as the leaves or a little longer. The flower itself is white with long, thin petals and stamens. The base of the flower is green. These attractive ornamentals have a large onion like bulb with a.root, but are not edible. The residue (thrash) from grinding the cane at a sugar factory is known as "bagash" and is used as a fertilizing mulch. Many yards on Ambergris have sugar cane growing in them. Thought to have originated in China and the East Indies, sugar cane has been cultivated since prehistoric times. Arab traders introduced it to Europe in A.D. 636 during the Dark Ages. It is a perennial clump-forming grass that can get up to 12 feet tall. The canes are 1" to 2" in diameter with long flat leaf blades. The leaves have a large midrib and rough edges. The flowers are fluffy plumes on a spike. The sap of the sugar cane is refined into sugar and the juice can be fermented and distilled to make rum. The fresh juice is 10 to 12 % sugar, slightly acidic and mildly laxative. Molasses is a product of sugar refining and contains a lot of the nutrients of the sap. The stems can be used to make fiberboard and the leaves can be fed to animals as fodder. When walking anywhere except well tended areas, wear sandals since the spines from this plant are not easily removed and are very irritating. The sand burr grows as the seed of a grass and has quite sturdy thorns that are decidedly uncomfortable to the barefoot wanderer. It usually grows in the untended portions of the island. This is a common grass that grows in cleared areas. The seed head is framed by 3 petals that is reminiscent of a flower. The blades of this grass are highly serrated and may lacerate the skin: protective clothing is in order, especially in the bush on the mainland. Archaeologists term this plant, the "guardian of the Mayan bush paths". A Purslane, probably Portulaca, this succulent looking plant grows low to the ground where it is exposed to the wind and more erect in protected areas. It has green leaves and a reddish stem. It can be boiled or fried and eaten, or used in soups and salads. This is a very common succulent that grows all over the beaches and back in the harsh salty marsh. The leaves are bright green on the beach and on the salt marshes have red tips. At one time some species were used in the glass making industry because of the high percentage of alkalis. Some.are edible and are boiled,salted and then pickled. Many of the 1 to 4 ft. high shrub-like plants on the beach belong to this family. These usually yield a white milky sap, sometimes poisonous. of the two plant types angiosperms (flowering) and gymnosperms (seeds not in a seed case), these are flowering plants, with small non-descript flowers of a sort on the blades. The immediate offshore sea grass beds are extremely important habitats for the young lobster and young conch. The sea grasses in the area of Ambergris Caye consist dominantly of Thalassia testudinum and Syringodium filiforme, with some areas of Halodule beaudettei. These grasses provide a lot of the bottom cover in shallow water and much of the plant material that constantly washes up on the beach. At exceptionally low tides, large areas where these grasses have trapped sediment off shore are exposed. The grass flats trap enough sediment that they tend to be elevated above the' surrounding sea floor, from a few inches to a few feet. While snorkeling on calm days over the Thalassia, 4 to 5' deep, if one looks carefully one can see streams of tiny bubbles of oxygen coming from the photosynthetic reactions of the Thalassia. Wrasses (fish) feed on the epibyonts (animals living on the plant surface) and in doing so nip out neat semi-circles on the blades. Look for this situation while snorkeling around the piers of your hotels, and while wading in 1 to 2 ft of water off the beach. Widespread in the Caribbean, this sea grass forms a lot of the "pasture" between the beach and the reef, in the shallow well lit waters. The grass is not common and very dwarfed, in parts of the lagoons within and behind Ambergris Caye and in Chetumal Bay. The long, green, flat blades sway with the waves and current. Not only does it trap and hold sediment moving across the sea floor, but it provides cover and a habitat for myriads of marine life. Thalassia residents include starfish, echinoids (sea urchins), worms, young lobsters, sea anemones and many varieties of gastropods (snails). A host of much smaller organisms grow attached to the grass blades such as foraminifera, bryozoa, nerites (Olive and Virgin Nerites) and small coiled worms (serpulids). The green of the living grass blade is often masked by the white colouration of the above mentioned organisms and the fine lime mud coating that tends to adhere to the slightly sticky surface. Thalassia flowers as do land grasses, but the new growth comes mainly from rhysomes, or runners, beneath the surface of the sediment. These rhysomes are so abundant that they form a very tough network within the sediment that prevents sediment from being moved except during very large storms. After heavy surge tides, Syringodium, because of its curved shape, when washed up on the beach, forms long tangles masses that look like large lengths of rope. Associated with Thalassia, this sea grass has long, rod like leaves that rather resemble a flexible pencil lead. it occurs along with Thalassia and at times makes dense patches of its own, especially near shore. Like Thalassia, it also has runners beneath the sediment, flowers and comprises part of the material that washes up on the beach. Very similar in appearance to Syringodium, it is shorter and thinner. It is very flexible to the touch and usually lives in the off shore intertidal Ambergris Caye. Like the other two kinds of sea grasses, it has runners underneath the sediment that trap and bind the sand and mud. Ambergris Caye is a geologic area dominated by calcium carbonate in various forms. The sands of the island, the beaches, material on the sea floor between the island and the reef, the makeup of the reef itself and the material shed from the reef into the deeper ocean offshore are composed dominantly of calcium carbonate with some magnesium carbonate. Algae is one very important source of this material. Unlike the algae that lives in fresh water and forms scums in ponds and unattended swimming pools, marine algae exists in various forms, many of which look like normal plants. A lot of the algae contains calcium carbonate as an internal skeleton to help it form an erect plant to lift it off the sea floor. When it dies, the organic part of the algae decomposes and the calcium carbonate portion falls to the ocean floor to become part of the sand and mud. Algae is classified by scientists according to the colour of the living plant as examined under a microscope. Green algae (Chlorophyta) is found most commonly in fresh water, but 20% of these types of algae are marine and the source of most of the algal component of the sands. Brown algae (Phaeophyta) are almost exclusively marine, but do not contain much calcium carbonate and contribute little to the sands. Red algae (Rhodophyta) are also mostly marine, but only one group, the coralline algae, contribute calcium carbonate to the sands. The last group, blue-green algae (Cyanophyta), does not have readily recognizable plant forms in this area and will be noted only in passing. This delicate algae grows similar to a flower, with a slender stalk topped by a disc. The disc is a light green, up to 8mm across and has a pattern of lighter coloured lines radiating outward from the centre. This algae can grow either in small clumps on rock, coral and shell fragments, or can form meadows on rocky bottoms. It is often coated with lime mud deposits and can be rather hard to see. It has calcium carbonate as its internal skeleton in the form of microscopic needles and upon death contributes these to help form lime mud. It grows between the reef and the beach. Algal Distribution. Heavy bars indicate where each type is most common. This green algae has a single blade that looks rather like a smooth ping pong paddle with some slits on the outer margin at times. It grows upright on the sea floor from a stalk and has a holdfast (root-like structure) that anchors it to the sediment. It grows in areas with only slight to moderate wave action. Casual inspection may confuse it with Udotea described later, but Udotea has a wavy or crenulate outer margin and Avrainvillea has a rather smooth outer margin. It grows between the reef and the beach. These small plants are usually on the order of 1" to 21, tail and grow in San Pedro lagoon and are not found off the beach. The individual club shaped plants look feathery and soft, and upon very close examination are a single stalk with a lot or little branches. It grows in large to small clumps and needs a hard substrate (bottom) to fasten to. This algae does not produce calcium carbonate. In the lagoons inside the island, Batophora is an excellent indicator of Pleistocene bedrock exposed on the lagoon floor. This is a highly variable group of algae, but they are characterized by having a root-like runner under the sediment surface from which roots project downward to anchor it, and leaves grow up from it above the sediment surface. Occasionally, the runners will branch out. When seen on the sea floor, these algae appear as straight lines of leaves projecting above the sediment. A green algae that grows on the intertidal at Basil Jones and washes up on the beach from time to time, it looks rather like a bright green bubble growing on the rocks. It is tough and leathery to the touch and is hollow on the inside. This is a very distinctive algae that can grow both on soft mud and sand bottoms and on hard rocks, such as in the reef. It has distinct segmented plates with somewhat flexible joints that may be dusted with sediment. It attaches itself by means of a holdfast consisting of filaments that anchor it in soft sediment or on rocky surfaces. Upon death, the plates of Halimeda tail to the ocean floor and are then broken up by physical and biological means to form a significant portion of the carbonate sand. Penicillus has a simple straight stalk with a tuft of dark green filaments at the top. It grows singly and often is dusted with mud and sand fragments. It looks like a small tree growing on the sea floor. Same of the forms have a bowl shaped depression in the tuft that collects carbonate sand and mud. It has a holdfast that anchors it firmly in the sand. Microscopic calcium carbonate needles in the filaments comprising the tuft are released after death to contribute lime mud to the sea floor. This fan shaped algae grows on a short stalk that may not be apparent. The fan on top of the short stalk is one single blade that usually has crenulate edges. Larger specimens often have several tiers on the blades. Individuals may be partially encrusted with lime. This odd algae grows in a spherical form with peg-like attachments that fasten it to a hard surface. It is rather fragile and is easily damaged by handling. It is found close to and on the reef, especially the back side. They are found on the pilings of the pier. but more common on vertical rockfaces and under ledges right in the back reef. These are those curious green balls. The three little legs.are attachment points and will not be seen with the naked eye. Growing primarily on the shallow reef environments and at patch reefs like Mexico Rocks, Padina looks like a thin, ruffled fan waving in the currents. At Mexico Rocks it tends to grow in notiable clumps, and is usually tannish in colour. Species of this genus of algae are often termed seaweed as they look more like land plants than other algae. This algae has long central stems with leaf-like organs growing from the stems, and small, spherical gas bladders that are filled with nitrogen and enable the plant to float. There are two species of Sargassum that float freely in the ocean and are the forms that the Sargasso Sea is named for. These floating forms are concentrated by the swirl of the gulf Stream in the North Atlantic centred near Bermuda that encompasses an area nearly equal to that of Europe. Sargassum is found on the beaches of Ambergris Caye after it has been washed up following a storm. Turbinaria is an erect, tall plant with a central stem that grows attached to a hard surface. Instead of having leaf-like growths from the stem, it has small branches that end in pyrimidal trumpet shaped bodies that are very distinctive. Like Sargassum, nitrogen in the pyrimidal bodies allow the algae to float and help keep it upright off the sea floor. This algae is very common on the back side of the reef where colonies may be seen gently swaying too and fro with the currents. It is a significant component of the material that washed up on the beaches. This branched algae is firm to cartilagenous when living and its branches commonly bear spines. It has an erect axis with many branches that often obscure the central axis. Eucheuma is a source of the macromolecule carragena that is used to keep things like paints in suspension. It is found in the waters off the southern part of Ambergris Caye. Gracilaria has branches off a central axis, but has no spines on the branches. It is fleshy to cartilagenous when living and when dried out, the pencil thick branches become thin like matchsticks. This algae is an edible form that can be boiled and used as a base for a milk punch "atole". It has the same occurrence as Euchenuma. A red algae that has a calcareous internal skeleton and looks like a small, fragile branching coral. It grows as a compact "bush" on the ocean floor and upon death its fragments contribute to the sand. Although this algae is a purplish red colour when alive, the dead branches and fragments are white. This algae prefers shallow, near shore, rocky bottoms and is more common on the northern parts of Ambergris Caye. Scattered specimens may be found in the back reef, attached to dead corals. "The Field Guide to Ambergris Caye"